Getting married is certainly one of the great events in your life. 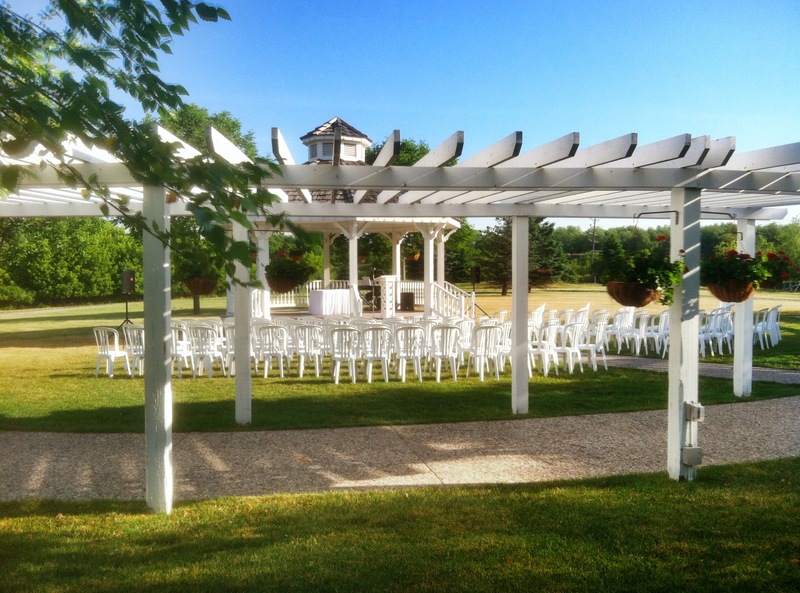 Having the Ceremony and/or Reception in the Great Outdoors just adds the right amount of romance to make your Wedding a spectacular event. At least that is the theory! For those of us living in the Midwest with its variable weather, planning outdoor Weddings can be a really tricky affair. In the Midwest the “outdoor season” for Weddings is short: late May into early October if we are lucky. The fact is: really awful weather can happen any day of the year! 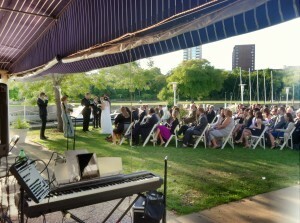 Interest in outdoor weddings increased dramatically during the sixties when the Baby Boomers started getting married. Up until that era, almost all Weddings were strictly indoor events. The exception would be if you were a celebrity or a member of a country club. As part of the counter-culture swing against anything that your folks did, adventuress Boomer couples literally headed for the forests and fields for their Weddings. 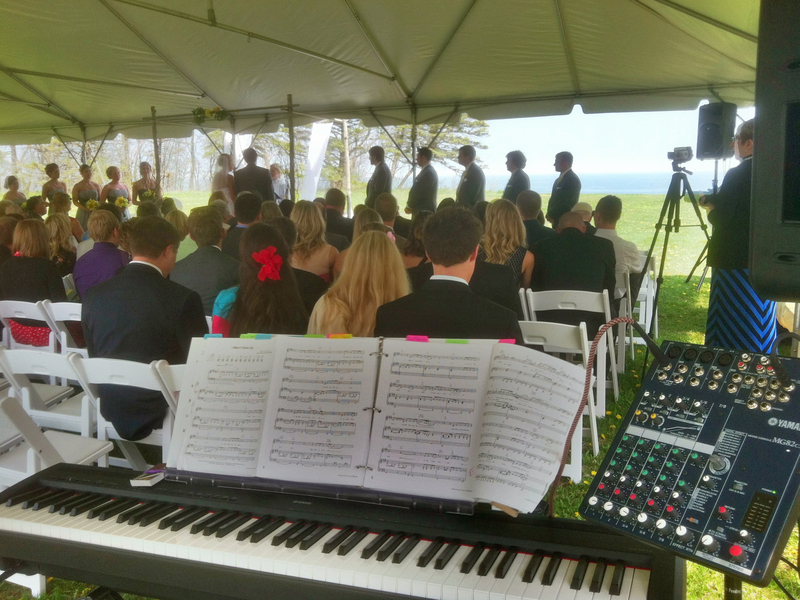 As a wedding musician, I am very glad that wedding trend has now faded into history. Today, Brides who are interested in an outdoor Wedding are looking for a much more civilized natural experience than their Hippie grandparents. Now, “back to nature” usually means a patio, deck or golf course. What follows is a gallery of photos from outdoor Weddings that I have played for recently. I hope that they give you some inspiration as well as some practical hints on how to deal with the Midwest’s changeable weather. Being outdoors doesn’t always mean being surrounded by nature. The Milwaukee County War Memorial is right on the shore of Lake Michigan. 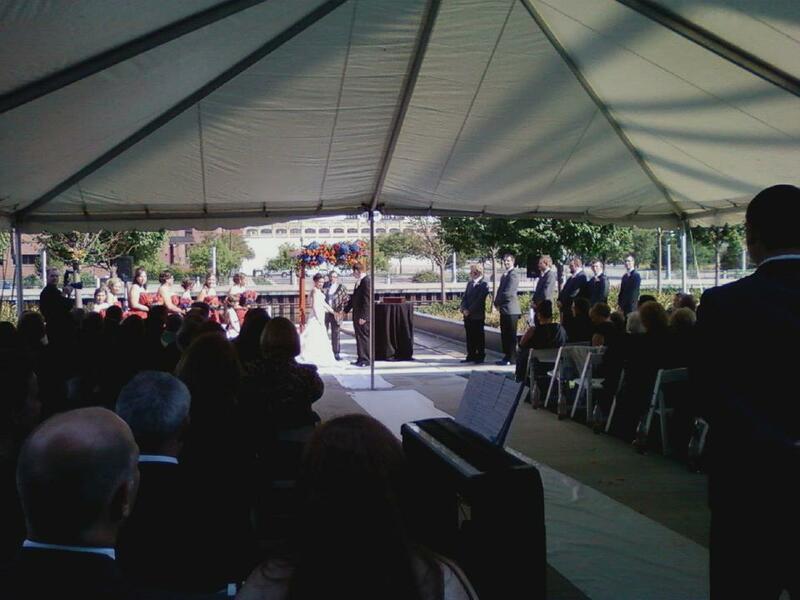 This set up on the huge “patio” put me halfway between the site of the Ceremony and the site of the Reception (out of the picture to the right). My sound system is powerful enough to be heard from quite a distance as you can see here. 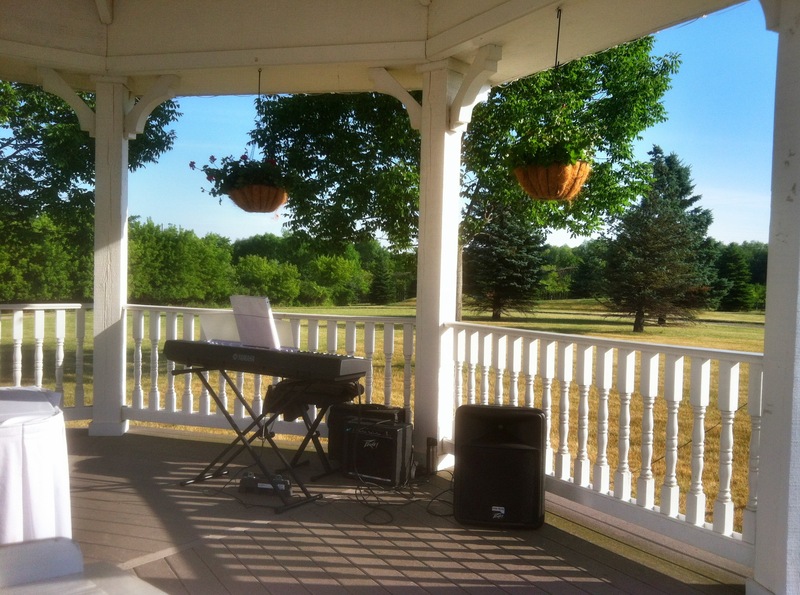 This is my idea of a perfect outdoor set up with adequate protection from the sun, wind and precipitation. The Gazebo at the Country Springs Hotel in Pewaukee and the surrounding grounds are beautifully landscaped. 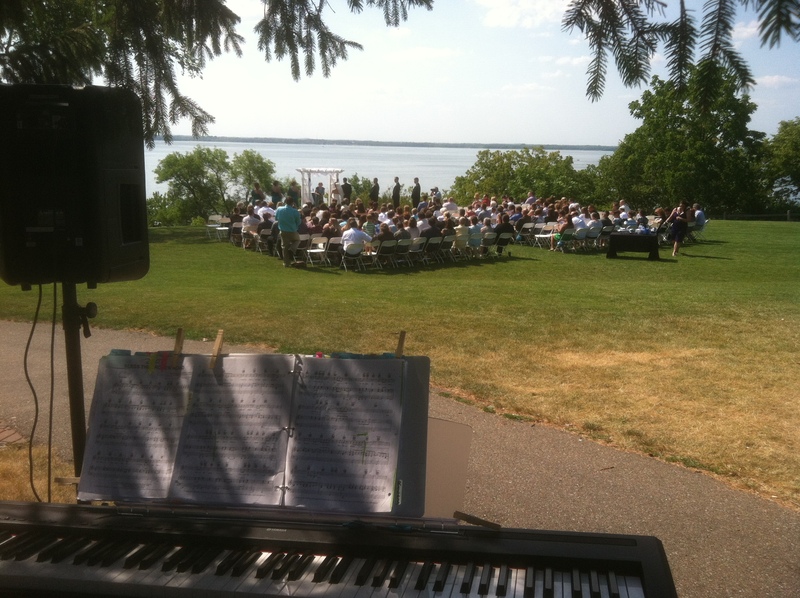 This wedding was at the Koshkonong Mounds Country Club in Fort Atkinson, Wisconsin. It was a torrid day so I sought some shade under a tree. 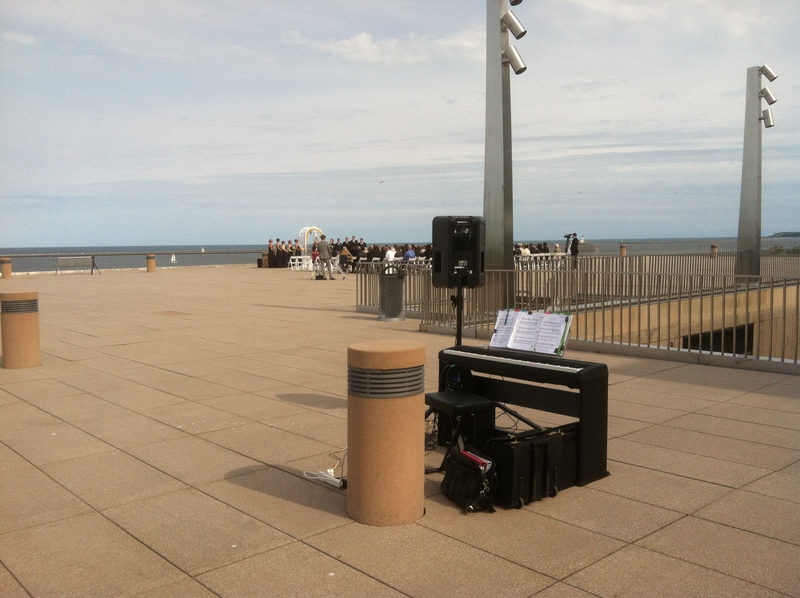 Again, my sound system handled the distance without a problem. 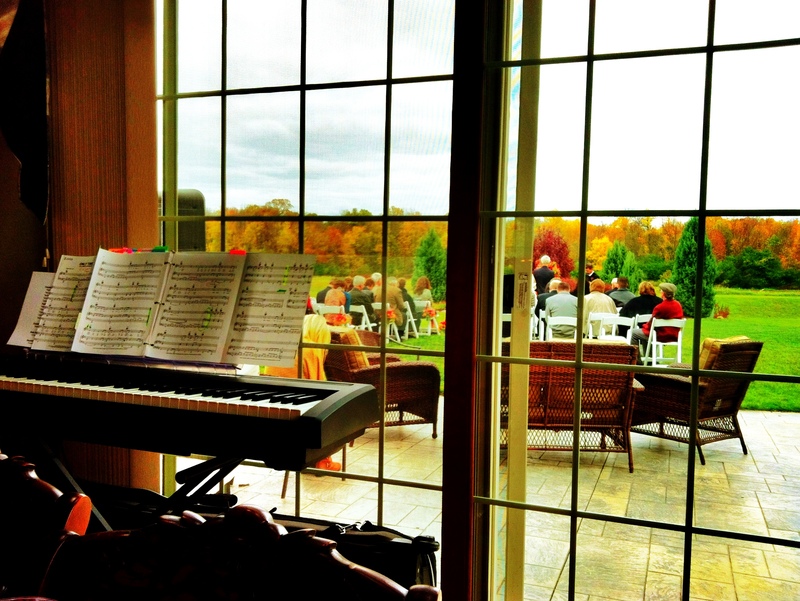 This was by far the coldest outdoor Wedding I have ever played. It was at the aptly named Glacier Canyon Lodge in the Wisconsin Dells. It was late-October and the temperature was in the forties. I could barely move my fingers even though I wore gloves between songs! There was a “Plan B” to move inside the Lodge but it was not used. Lesson: Always have a “Plan B” and when necessary use it! The use of a tent for outdoor weddings is highly recommended. The Bride in this Wedding at the Harley-Davidson Museum in Milwaukee was one lucky lady. 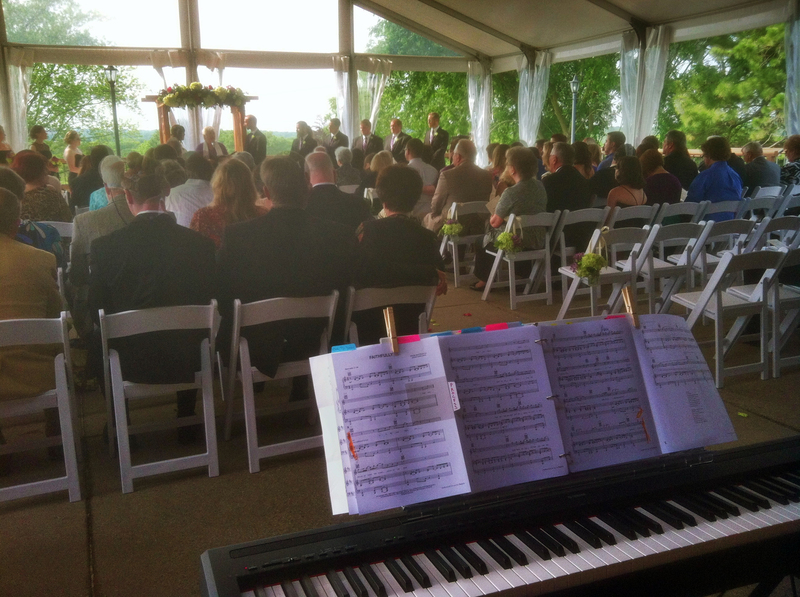 When I arrived — as usual — an hour ahead of the Ceremony it was pouring rain. Shortly, and I mean shortly, before the music was to begin the rain let up and the skies cleared. 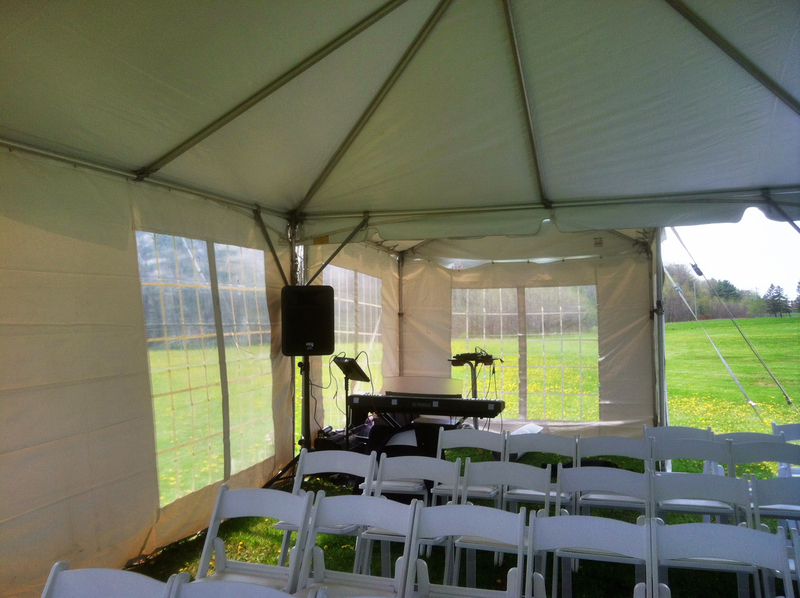 If it wasn’t for the tent the Wedding would have had to have moved indoors. 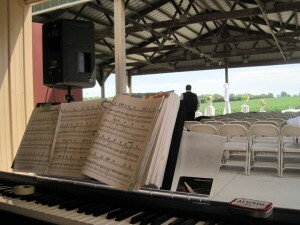 Modern brides rarely get married in the middle of a field but this Wedding near Columbus, Wisconsin, cam pretty close. The site was surrounded by lush corn fields. 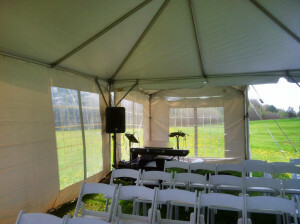 The shelter where the Wedding was held as a “sun shower” swept through during the service. 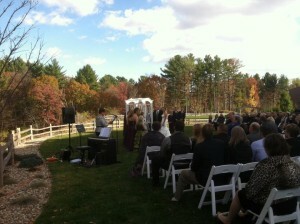 Here is a patio Wedding in Merton. Again, it was a very cold October day. 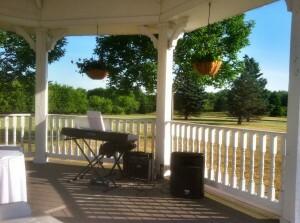 I was glad that we were able to place the keyboard inside and the sound system speaker outside. Sounded great and my fingers were able to move without gloves. 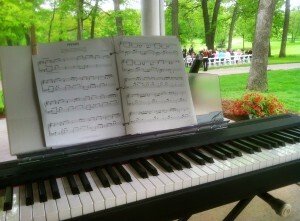 This was one of my favorite outdoor Weddings. 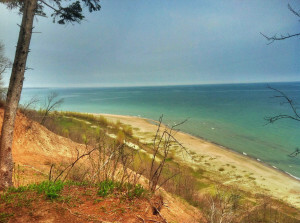 The May Wedding was in a park in Mequon, Wisconsin, on the top of a high bluff overlooking Lake Michigan. I had discussed with the Bride ahead of time my concern about being exposed to the elements with, literally, no shelter with 100 yards of the site of the Wedding Ceremony. So, she had a beautiful tent erected to protect not just me but everyone from the potentially awful lakeside weather. I was even provided with my own little “room” to set up in. This kind of accommodation by the Bride helps make this one of my all-time favorite Weddings. Porches are welcome shelters especially when the elements are not cooperating. 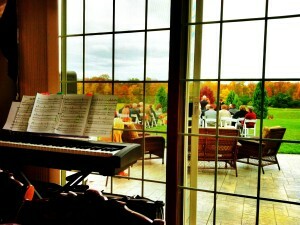 This Wedding was at the New Berlin Hills Country Club. Silver Springs Golf Club in Menomonee Falls, Wisconsin, has a very nice roof-top patio. It is protected by a “permanent” tent structure the walls of which can be opened on a nice day and quickly closed when the weather is uncooperative. 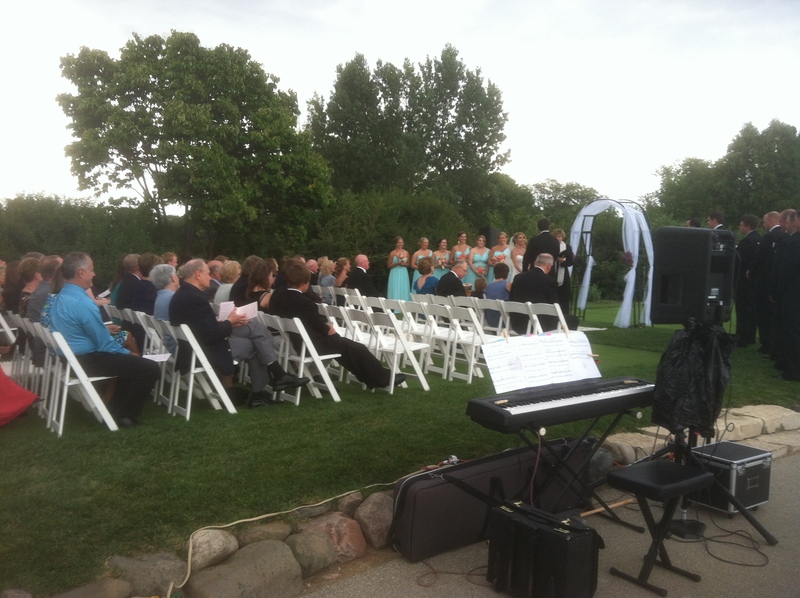 A tee at the Blue Mound Golf and Country Club was the site for this outdoor Wedding. It was pretty nerve-wracking as there were thunderstorms in the area. The rain never came but I was very relieved to end the Recessional and pack up my equipment. 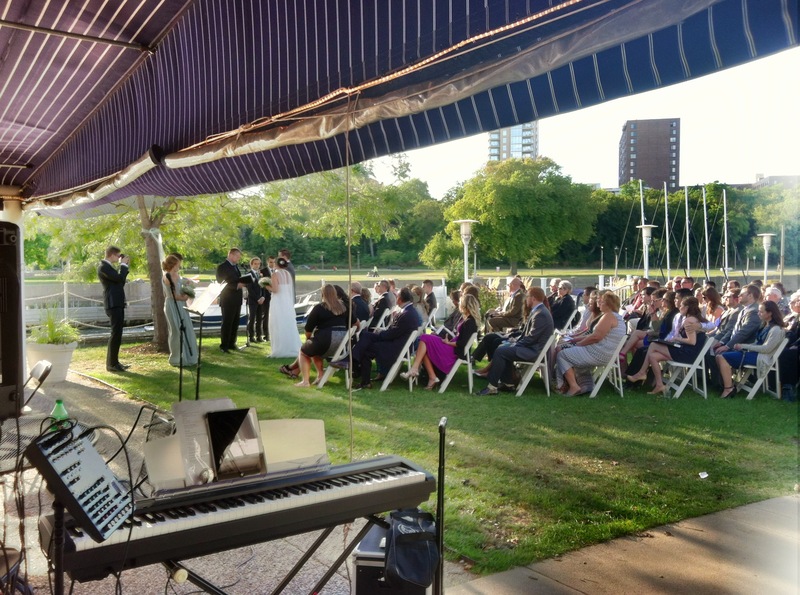 A beautiful sunset Wedding at the Milwaukee Yacht Club. Again, a proper shelter makes everything go more smoothly. I would love to work with you to help make your own Wedding or special event a truly beautiful experience for your family and friends. For more information please go to my main Wedding Music page. This entry was posted on February 28, 2014 and tagged Wedding Music. Bookmark the permalink.